In 1922, James Joyce published his magnum opus, Ulysses, a work that has been loved, ridiculed, studied, and banned. The entirety of the novel takes place on June 16, 1904, and scholars, geeks, and fans of Joyce have been celebrating “Bloomsday” for decades. 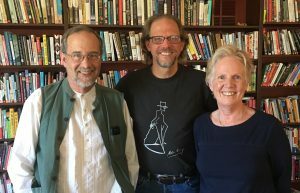 We discuss the novel, its impact, and the upcoming Bloomsday celebration in Santa Fe, with Adam Harvey actor, performer, and James Joyce geek; Grant Franks Tutor at St. John’s College; and Martha Franks writer, water lawyer, and teacher.